Most coffee drinkers are big fans of French press coffee. French press coffee has a lot of benefits. It is not made with paper filters that will remove flavor, it allows for some steeping to soften it and add flavor, it has completely saturated coffee grounds, it usually has no impurities, and it is often at the perfect temperature. For this type of flavorful French press coffee experience, you first need a French press coffee maker. French press coffee makers allow your grounds to slowly swirl around in boiling hot water before you use the plunger to squeeze the coffee into your cup. If this process sounds delicious to you, you are right, but it might surprise that it is not as complicated as it might sound. 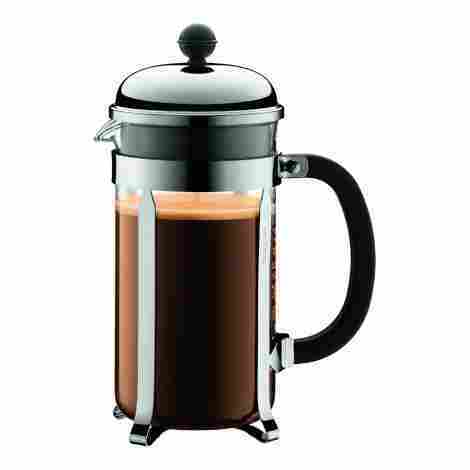 French press coffee makers are usually relatively affordable, easy to use, and easy to store. Additionally, while the process of making the French press coffee may not be as fast as the process of making instant coffee, the best French press coffee makers will not take longer than five minutes to make you a fresh cup of coffee. Therefore, it does not take too much effort in order to brew your coffee just the way you like it. 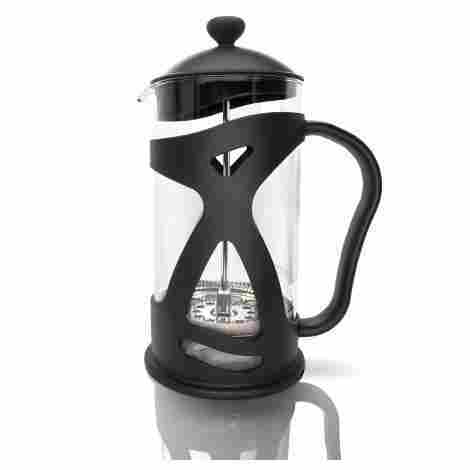 You just need to choose the best French press coffee makers. Some can even make a delicious tea and other tasty juices. Because the mechanics of making French press coffee is very uniform and straightforward, the main difference between all the French press coffee makers is the material that they are made from. Usually, French press coffee makers are glass to allow you to see the coffee. However, some will be stainless to steel in order to allow for more durability. Others are ceramic to maintain heat. Bodum is a reputable French press coffee maker brand. Their Chambord coffee maker is probably their most popular model and for a good reason. It easily makes three cups of-of delicious French press coffee in about four minutes. Because of the borosilicate glass on the coffee carafe, the Chambord is both easy to use and easy to keep clean. It also makes the design look elegant, so it makes for perfect decor in your modern kitchen. The stainless steel plunger is extremely durable. Inside the plunger, there is a mesh filter that will get all the flavorful oils out of the coffee grounds and into your mug. The Bodum Chambord is definitely on the cheaper side. The three-part plunger is built to last a long time. As long as you are careful with the glass, it will take awhile before this high-quality coffee maker starts to wear down. The StirlingPro Double-Wall Stainless Steel French press coffee maker can hold up to one liter of water, so it can fill up approximately four cups of coffee or tea each time you use it. 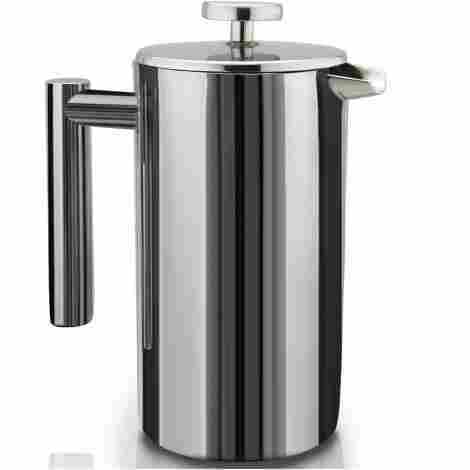 Without any plastic parts added to this French press coffee maker, the double wall of 18/10 stainless steel with a shiny and polished mirror finish will remain resistant to rusting. The second screen will catch any large pieces and sediment that the first filter might have missed. As a result, StirlingPro promises that the coffee will be sediment free. This coffee maker is on the cheaper side. For something that will make about three or four cups of coffee at once, it is an incredibly reasonable price. It is also built to resist many forms of wear and tear. The KONA has a stainless steel filter and a glass outer shell. It holds about 34 ounces of water, which will provide you with up to seven cups of coffee. The black designs on the outer shell of this French press coffee maker will protect the glass part of it from chips, scratches, and cracks. It also looks great in your kitchen. The handle is big, comfortable, and super easy to use. It is designed so that pouring your coffee is also easy. It matches the lid that prevents any plastic parts from coming into contact with your coffee. 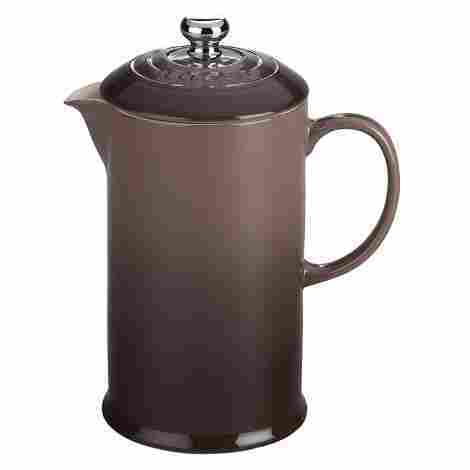 This French press coffee maker is quite low in price in comparison to other options on our top ten list. Despite its super low price, it still works great. It is not easy to break because of the protective covering, so it should last for a relatively long time. This French press coffee maker design is made out of stoneware. It comes in many different colors so that it will match all your other cookware. It is also twelve ounces, so it can easily fit wherever you want it. This coffee maker is neither glass nor steel. It is stoneware, which is like stainless steel in that it is very good at retaining the heat. It also prevents scorching, rippling, cracking, and grazing. The stoneware is great at dealing with the heat, which means you can but this coffee maker in your oven or microwave if you really wanted to. It also works well with the cold, which means you can put it in your fridge or freezer if you want it to be cold. The Le Creuset American Stoneware might be a bit expensive, especially for such as small coffee maker. However, it is resistant to many forms of damages, which means it will definitely last. 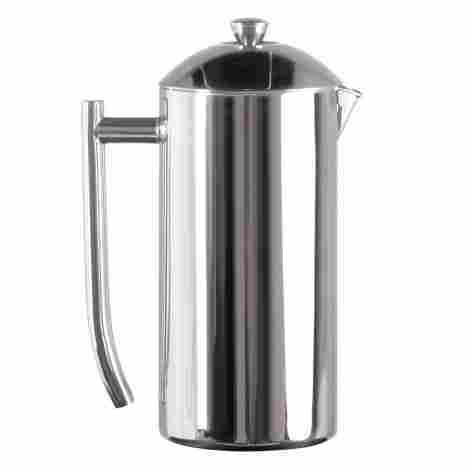 This sleek and shiny stainless steel model is great for keeping your coffee nice and warm. It holds about 36 ounces, which means it can make almost ten cups of French press coffee. The filtration system of this coffee maker comes in two stages, which ensures that there is no sediment floating around your coffee. The first filter will remove the larger grains, while the second will focus on smaller pieces of sediment. The double wall 18/10 stainless steel carafe means that this French press coffee maker is very good at retaining the heat for an extremely long time. If you briefly forget to watch your coffee, it will not get cold. This French press coffee maker is definitely high-end, which means it is going to be on the expensive side. Because of the well-insulated stainless steel design, the Frieling is going to cost you more than other options on our top ten list. This is another 18/10 stainless steel coffee maker. It holds up to 34 ounces of water, which will probably provide you with around seven or eight cups of delicious French press coffee. If two filters was not good enough for you, then Secura has the solution because this model comes with three filters. The chances that there will be any sediment left in your coffee is very low. The handle of this coffee maker was designed to be cool to the touch, regardless of how steamy your coffee is. As a result, the handle allows for safe and easy pouring. 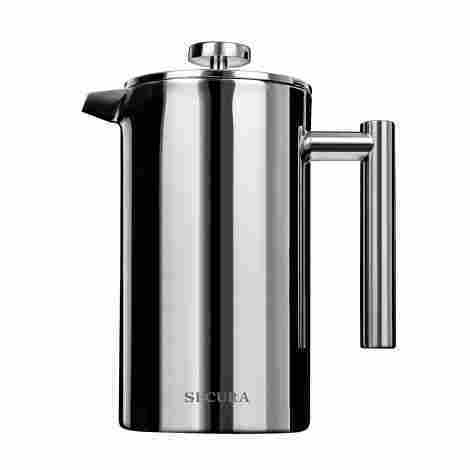 The Secura Stainless Steel French Press Coffee Maker is definitely a pretty reasonable price for a sturdy stainless steel 34-ounce product. 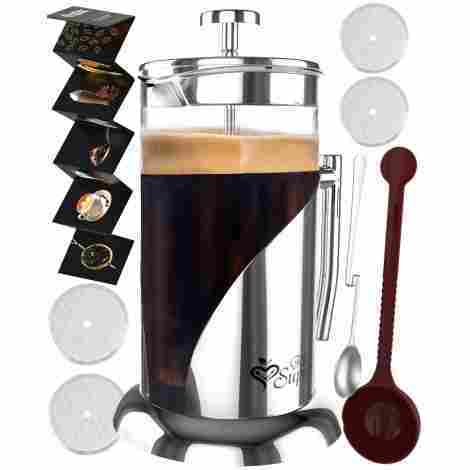 At 51 ounces, the GROSCHE Madrid French press coffee maker a sizeable amount of coffee at once in only three or four minutes. It is made from a combination of glass and stainless steel parts. French press coffee drinkers are definitely not a fan of sediment, so the GROSCHE Madrid is another coffee maker that decided to add a second filter. One filter is in the lid and the other one is in the main press. This glass model has the perfect minimalist aesthetic for your modern home. However, its design has practical uses as well. For example, it has grips so that you will not drop it. The 51-ounce model is about middle of the range in terms of cost. This price is definitely reasonable considering the size. The stainless steel parts should last you a long time. The glass parts can also take a while to wear down if you treat it well. 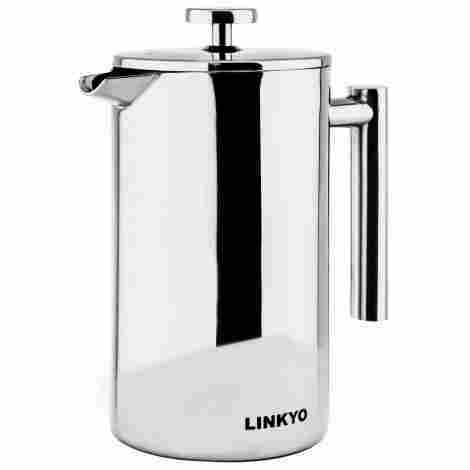 The LINKYO French Press Coffee maker is a sterling steel model that holds about 34 ounces of water, which will give you about seven cups of French press coffee every morning. The stainless steel of this coffee maker is essentially unbreakable. You can drop it as many times as you want and it will not break. The two walls of stainless steel allows this coffee maker to retain heat incredibly well. At the same time, it will be relatively cool to the touch, so you will not burn yourself. This might not be the cheapest French press coffee maker out there. However, for a 34 ounce incredibly sturdy stainless steel coffee maker, it is probably worth the money. This option is a high quality milk frother and coffee maker. The stand is made from sturdy stainless steel, while the outside carafe is made out of borosilicate glass. Unlike many other good coffee makers, this one comes with a milk frother that you can use for lattes, hot chocolate, and other drinks. Some people even use it for making salad dressings. The screw-top design of the lid is a unique design that most other coffee makers do not have. It means the lid will not fall off and it will not allow any heat to escape through the top. With the added milk frother, you might expect this option to be more expensive. The glass carafe probably lowers the price since glass is usually cheaper than stainless steel. Made from a combination of stainless steel and German glass, this French Press coffee maker can hold about 34 ounces of water to give you about seven cups of coffee or tea. There is no plastic on this coffee maker because it is built to adequately deal with the very high temperatures required for a perfectly brewed cup of French press coffee. It might sound redundant to have four filters in your coffee maker, but you might need the all the extra screen if you keep finding coffee grounds and sediments in your cup. The Kitchen Supreme French Press Coffee Maker is definitely relatively inexpensive. The company also promises to replace it for free if it breaks so you are getting a ton of value with that kind of warranty. Without the right kind of filters, your coffee might have sediment floating around the bottom. However, too much paper filtration means that much of the oils that are found in coffee will not get into your cup. Unfortunately, these oils often contain the most flavor. Therefore, you should use French press designs to ensure that all the right flavors are getting into your coffee mug. With the right products, your French press coffee will be sediment free, nicely brewed, and steaming at the perfect temperature. All you have to do is find a French press coffee maker that is built well, insulated, and filters out all the coffee grounds without filtering out any of the delicious oils that have the potential to make your cup of coffee incredibly flavorful. There is a reason why French press coffee is considered the best type of coffee. In order to get the most out of this type of coffee, you will want to choose the French press coffee maker that works best for you. All the different French press coffee makers might seem incredibly similar to each other, so it might feel difficult to pick the one unique feature that fits your needs. The truth is that many of the different choices are relatively similar and, in some cases, the type of coffee grounds you use will matter more than the type of coffee maker. However, a good French press coffee maker can still make all the difference in the world, so there are some features and designs that you definitely want to look out for. The best coffee machines will meet certain criteria that others do not. A big benefit of French press coffee is that it tastes great because they use mesh filters in place of paper filters. These mesh filters are unlikely to remove flavorful oils from your coffee, while paper filters probably will filter too much oil. You want the least amount of filtration possible in order to make sure your coffee ends up with as much taste as you can possibly squeeze out of the coffee grounds. However, if your coffee maker does not have enough filtration, sediment might start floating around the bottom of your cup of coffee. Therefore, there is a careful balance between adding as much flavor as possible and stopping hard pieces from slipping into your mug. The best coffee makers have mastered this balance. They will have between one and four screens that filter out variety of sediments without filtering out the flavors. Each filtration system is slightly different and the one you choose will definitely depend on your preference. If you absolutely hate sediment, then you might want a coffee maker with an extra filter. If you care more about the taste, then you probably should choose a coffee maker that does not have too many filters. If you are trying to brew hot coffee, you do not want your coffee to be lukewarm. You should have as much control as possible over how steamy you want your coffee to be. The temperature of the water that you choose to initially pour into the machine should be relatively close to the temperature of the finished product. However, when hot water is sitting around for five minutes as the coffee maker allows your coffee grounds to brew and swirl, it tends to cool down a little bit. In order to prevent your coffee from getting colder than the ideal temperature, a good coffee maker will be well insulated. Very little heat should escape through the lid or through the carafe. Some types of coffee makers are so well insulated that you can allow the coffee to sit in the maker for a very long time before it starts to get cold. Others only retain the heat for a couple of minutes, but a couple of minutes is still enough to ensure that you are never drinking coffee that is too cold for you. As most people know, coffee can be addicting. Therefore, if you are a consistent coffee drinker, you are probably drinking a cup almost every day with very little plans to change your habits. As a result of so much coffee drinking, you are probably using your coffee machine quite a lot. When you use something so often, it can wear down quickly. However, you do not want your coffee maker to break soon after you purchase it. If you are going to invest in a French press coffee maker, then you definitely want to make sure that you manage to get a good amount of use out if. There is a number of different ways to ensure that your coffee maker is durable. Stainless steel and well-made glass or stoneware should all last a long time. Some of the better coffee makers also have certain protective features that prevent breaks, cracks, scratches, rusting, and chips. If you know you are likely to break something, then you probably want to consider investing in stainless steel. If you trust your coffee pouring coordination, then sturdy glass or stoneware should be durable enough for you. Every food item has to be cleaned every now and then. Since French press coffee makers are usually made of multiple parts, they are not always the easiest item in your kitchen to clean. Every time you want to clean, you will likely have to disassemble the whole thing and reassemble it when you are done, which is not always an easy task. Additionally, some of the parts may not be safe to use in the dishwasher. Glass parts can be especially difficult to clean because glass does not always do well with rapidly changing water temperatures. When you are choosing a French press coffee maker, you need to consider how much effort you are willing to put into cleaning it after use. You may not have the time or energy for handwashing all the parts, which means you should look for a coffee maker that is safe for dishwasher use. You should also consider how easy your coffee maker is to take part and put back together. For the most part, coffee makers are going to be relatively harmless. However, any hot product is going to the run the risk of burning your skin if you are not careful. Therefore, the safety features on your French press coffee are important. You do not want to burn yourself the second you pick it up to pour, and you do not want any glass parts to shatter and cut your skin. There a number of different safety features used to keep coffee makers safe. Some are very well insulated so that all outside surfaces are cool to the touch. Some are very durable so that it will never break on you, spilling scorching hot coffee onto your skin or causing sharp edges to cut you up. Some have comfortable handles or grips to prevent you from dropping it, breaking it, or spilling it. Whatever the safety features are, they are all pretty crucial and should be taken into consideration, especially if you know that you are prone to breaking or dropping things. Everyone has a different desired price range. Some of the good French press coffee makers might be a little bit pricey, but nothing should seem obscenely unreasonable. If something is expensive, then you want it to be high end. It should last a long time, and it should do its job exceptionally well. Some of the better French press coffee makers could be pretty expensive, but most will find that they are well worth the money. You probably want a French press coffee maker that holds about one liter of water. However, sizeable coffee makers are definitely a little more expensive than smaller ones. Therefore, you need to figure out if you are going to want to make more than one cup of coffee every morning. If you only want one cup, then there is very little reason to invest in a French press coffee maker that is more than twelve ounces. Otherwise, you might want to consider a larger model. After all, when you ignore the price, a coffee maker that is too big is better than one that is too small because you can always add less water than the maximum capacity. The way your coffee maker looks does not affect how well it works, but it can still be important. All the best coffee makers have a fairly modern aesthetic. Some come in multiple colors so that you can choose the one that looks best in your kitchen. Of course, plenty of people are not fans of modern and minimalist aesthetic, which means that many types of French press coffee makers may not work well with the style of your kitchen. If you do not like the way a French press coffee makers look, then your coffee maker should be easy to store so that you do not have to leave it lying around in your kitchen. Almost any French press coffee maker is good for brewing both tea and coffee. However, some are specially designed to be equally good at both. 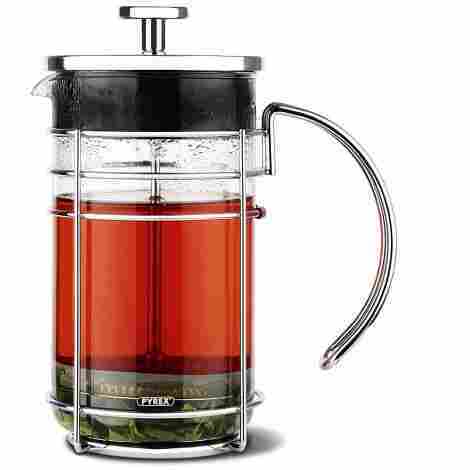 Therefore, if you are a fan of tea, then you might want to choose a French press coffee maker that is designed for more than just coffee grounds. 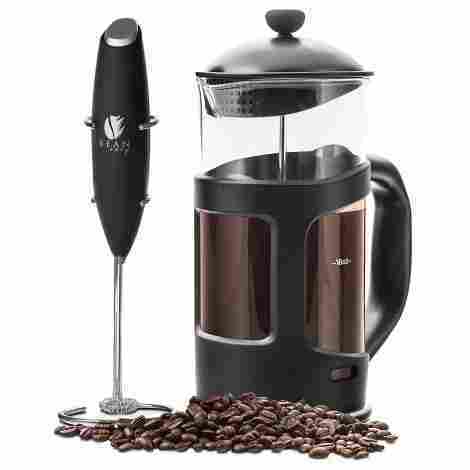 Additionally, many French press coffee makers are great for unexpected drinks, including juice, chocolate milk, cocktails, and fancier types of coffee such as lattes and cappuccinos. Using your coffee maker just for coffee is completely acceptable, but you still want to consider the possibility of getting other types of use out of it. Some coffee makers also make very good pitchers for any drink because they are generally well insulated. An underrated advantage of French press coffee makers is that they are easier to carry around than other types of coffee machines. You usually travel with them quite easily. However, some are definitely easier than others. 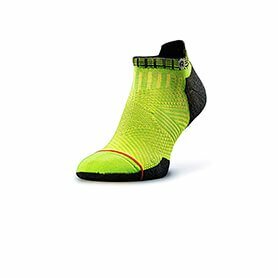 Certain materials might be a little heavier, and certain models might be a little bulkier. Therefore, if you think that you need to buy a portable option, you should stick to smaller and lighter machines. Q: Will hot water break a French press coffee maker that is made out of glass? A: Glass is definitely particularly fragile under very hot water. However, coffee makers are designed to be able to withstand a certain amount of extreme temperature situations. The type of glass chosen is usually relatively good at conducting heat and the glass on these coffee makers is relatively thick, so the chances of it breaking are usually very low. Still, you definitely should be careful if you choose a glass coffee maker. After all, they are cheaper than stainless steel options for a reason. If you want to get as much use out of a glass coffee maker as possible, then you can try your best to avoid pouring boiling hot water directly onto the glass. The glass will not shatter, but it can become more prone to cracking, which may cut your time with this coffee maker short. It should not make that much of a difference, but if you want to prolong the amount of time you need before purchasing a new coffee maker, it still might matter a little bit to you. You should also be careful about washing the glass. Most coffee machines will come with instructions about the best way to wash the different parts. When it comes to taking care of the glass, you definitely want to follow all the instructions as well as you can. Q: Are internal plastic parts dangerous? A: Hot plastic is never good for your health. However, almost any coffee makers will only have internal plastic parts that are BPA free, meaning they will not harm you. If you are still worried about melted plastic, you can choose to get a coffee maker that is plastic free. Some of the better French press coffee makers have no internal plastic parts, so there is no possible way that melted plastic could get into your coffee and harm you. Q: How many times should you lower the plunger? A: It may seem as though lowering the plunger multiple times will help you squeeze out as much coffee as possible. However, you should really only lower the plunger once. A French press coffee maker is going to be designed so that one push of the plunger will usually be enough. If you lower it too many times, then you might end up getting coffee with a much more bitter taste than you would like it to be. If very bitter coffee is your thing, then you can squeeze out all the extra bitter flavoring. However, if not, then one push should do the trick. Q: Does it matter what type of coffee grounds you use? A: The coffee grinder can definitely make a big difference in your coffee. If your grounds are too fine, then your coffee might be a little too mucky and sludgy because the plunger will not be able to keep super fine grounds at the bottom. If they are too thick, then your brew might not be strong enough.